The names "shrimp" and "prawn" are often used interchangeably, and understandably so. Shrimp and prawns have a lot in common: They both are decapod crustaceans (meaning they have 10 legs and exoskeletons), they both live near the floor of whatever body of water they inhabit, and their outer appearance—as well as when they're cooked—is very similar. However, it may surprise you to learn that shrimp and prawns are not even the same animals. Shrimp are part of the sub-order Pleocyemata, while prawns belong to the sub-order Dendrobranchiata. Shrimp and prawns can be found in both salt and fresh water; however, most varieties of shrimp are found in salt water while most prawns live in freshwater—particularly the varieties we purchase to cook. But it is not just where they inhabit that distinguishes one from the other. Although some aspects may not be as prominent as others, there are several parts of these crustaceans that help differentiate the two. Each of these types of shellfish have different types of gills; shrimp have lamellar (plate-like) gills, while prawns' gills are branching. In terms of their body makeup, shrimp have a side plate that overlays segments in front and behind; prawns side plates overlap tile-like from front to back. This structure affects their shape—a telltale sign whether you are eating a shrimp or a prawn is whether the body curls or not. The outer skeleton of the prawn doesn't allow it to bend at all and thus a prawn is somewhat straight. Shrimp, as we know, have a tight curl to them. Examining their legs will also help you decipher the two. Shrimp's front pincers are the largest and they have claws on two pairs of the legs. Prawns, on the other hand, have their largest pincers on the second pair of legs and claws on three pairs of their legs. Another difference between shrimp and prawns is that shrimp carry their fertilized eggs on the underside of their bodies beneath their tails and prawns release their fertilized eggs into the water to grow. In most cases, shrimp are smaller than prawns. But don't use this as the only marker for deciphering between the two as there can be large shrimp that are bigger than a typical prawn. Taste is also not a way of telling the two crustaceans apart. While different varieties of shrimp and prawns vary in taste and texture, those differences do not divide along "shrimp" and "prawn" lines. In short, while shrimp and prawns are not the same, their flavors are, and therefore make them interchangeable in recipes. Although it is clear these two crustaceans are very different from each other, the terms "shrimp" and "prawn" seem to be used interchangeably. The words "shrimp" and "prawn" originated in England but the UK tends to refer to both of these crustaceans as prawns. Food labeled as prawns are often larger than shrimp but aren't necessarily true prawns. Some "prawns"—such as spot prawns—are biological shrimp, and some "shrimp"—notably ridgeback shrimp—are technically prawns. And sometimes chefs and restaurant menus will label dishes slightly erroneously to make them sound more appealing, and shrimp and prawns are no exception, particularly if the recipe is ethnic in origin. 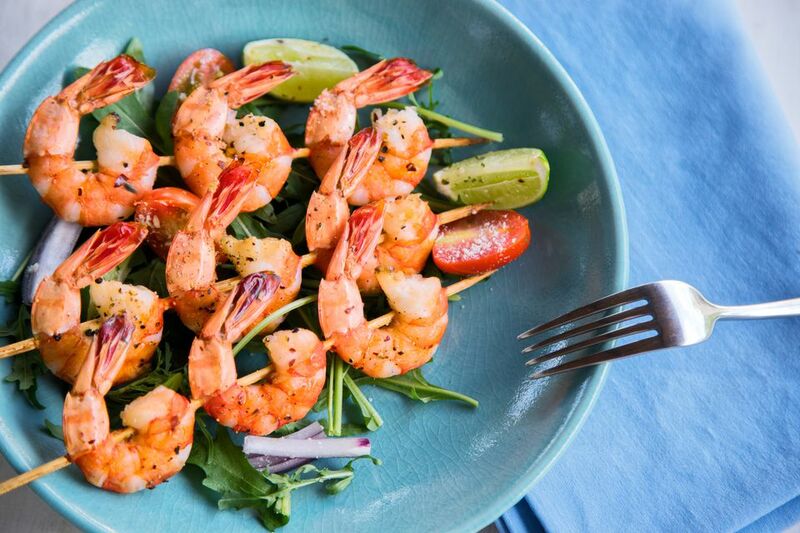 Choose your shrimp or prawns based on what size you want and what your recipe calls for, and whether they've been caught or raised in an environmentally responsible way. U.S. wild-caught shrimp/prawns is a well-managed fishery, for example. Similarly, U.S. shrimp/prawn farms follow better practices than many others. Along with size and how the shrimp or prawns came to be at the store, different types definitely have different flavor profiles and qualities, making certain kinds ideal for specific dishes. Whether shrimp or prawns, it is best to buy fresh when you can because frozen shrimp and prawns often have a rubbery, tougher texture after cooking. There are many ways to cook and serve shrimp and prawns. They can be grilled, broiled, fried, sauteed, or steamed, and can be cooked with the shell on or off. The most important thing to note when cooking is that shrimp and prawns cook fast. If using them in a stir-fry dish, for example, wait until the last minute to add them as they often will cook in under 1 minute. Shrimp and prawn's mild and sweet flavor make them extremely versatile and great to pair with a variety of ingredients, from simple to complex. You can throw shrimp on the grill and top them with lemon butter. Or marinate in hot sauce, cayenne, and garlic and before grilling to make a spicy grilled shrimp. Curry leaves, coconut milk, and chili paste add pizzazz to tasty Malaysian butter prawns. Serve Thai fried rice with pineapple and prawns in a hollowed-out pineapple half for a spectacular presentation. And poach shrimp or prawns to use as protein-packed garnishes in a traditional Spanish gazpacho or a green gazpacho, as well as on salads to transform it into a filling dinner.